And this whole ～なきゃだめだ thing is throwing me off. I’m not sure if it means you should eat more or shouldn’t eat more? I actually asked my tutor before, but I’m terribly unorganized and if I even remembered to write the answer down, I can’t find it, and can’t figure out if I already corrected the sentence translation or haven’t yet so I’m still kind of confused. It kind of sounds like “having to eat more is bad” but I have a vague impression that is actually a trap and it actually does mean “You need to eat more” and the double-negative is just emphasis. Help? This is a guest post by my friend マット! Any questions or comments, just message me here and I’ll pass them on. Enjoy! One thing I like about Pimsleur is that even in the early lessons, the speed of the audio is close-to-normal conversational speed. I think they do slow it down a little, but it seems pretty similar to the “spoken at near-natural speed” rating of the N3, even if the complexity is low. Though the content of the text, especially in the early lessons, is ridiculous. “Conversations” consisting of asking someone repeatedly if they’d like something to eat or drink and where they’d like to go. Not to mention it gets kind of creepy when you’re told to ask if they’d like to go to “your place” for a drink, and you haven’t even learned their name. I was reading a language-learning blog post yesterday that was talking about the importance of using the language from “day one”. To be honest I am not sure I can use that sort of learning approach unless I’m in an immersion situation and forced to come up with ways to communicate daily things, since I seem to have a lot of trouble coming up with things to say when I don’t have sufficient vocabulary otherwise. It would probably also help if I didn’t already find talking to people I don’t know to be kind of a headache and something I avoid. Not to mention I also tend avoid talking to people I know, because I’m a borderline hermit. Anyway, despite my personal difficulties with employing this kind of learning-style most of the time, I do feel there’s merit to the idea that application matters a lot in terms of how quickly you’ll pick up a language. With the caveat that I haven’t looked up any data on how this applies to people in general, but I do find it true of myself that learn better by “doing” in general, and languages are no exception. But I think it’s kind of up to the individual to figure out how to do that and at what pace– faster isn’t necessarily better, depending on your end goal. This is all a tangent, though. Still always think in English, and while I switch over somewhat when I am speaking Japanese, it’s an effort and takes a while for me to switch. And then I still end up half-thinking in English which I want to change. At this point I’m realizing I’m writing all my entries in English and thinking in English all the time not because I don’t have the words for it in Japanese, but just because it’s harder/slower in Japanese and I might get it wrong in Japanese, which well. Obviously. On that note, I think now is the time I should actually start doing more posts on Lang-8. I started doing a 30 day meme a while ago, but I stopped because I found it impossible to figure out how to say some things I wanted to, but I’m thinking I should restart that on Lang-8. In other news, not sure if I’m going to make even my measly, cut-down-from-the-half-challenge 25-book goal for the Super Challenge. I’m still only at 6 books, and I keep being too tired to read anything longer than a sentence or tiny paragraph. I did just install Yomichan to Anki and started trying to read HP, but in the first sentence alone I ended up with ten cards, so that was a bit hilarious. I’m not really sure how I want to pick out vocab I would like to add as cards yet, because I think it’s probably excessive to save all the words I don’t know completely. Several I could get the gist of from context, but added anyway because I knew I wouldn’t remember pronunciation or a particular nuance. I think maybe I should avoid doing that so I don’t have a million cards just from page 1, and then won’t study them because that’s too much. Anyway, I’ve been avoiding doing my textbook pages, so I should probably just do that at this point. I’ve been using Pimsleur for Japanese practice for a while now. The first level I really breezed through, because it was all so super basic I pretty much knew 80-100% of the material on each lesson on first listen, so it took me about a month, about what you’d expect given it’s 30 lessons of 30 min each, and I did probably on average 1 per workday (M-F), with some days getting through 2. The second got a little more difficult, but I still managed to get through most lessons with just one listen, so it took me only a couple months total, though I had a break in the middle, I believe. The third level I’ve been working on for a couple months now and I’m halfway through. Mostly it’s still not that I don’t understand or know the material at all so much as I only know it passively, and have to activate it so that when I think I want to say the phrase, I can actually come up with it. And since they’re longer sentences, I’ve been listening to each lesson more l like 4-5 times each to make sure I have close to instant recall. Basically, I find Pimsleur is really good for conversational practice of a sort. It doesn’t really beat having an actual conversation partner, but it’s good at helping build up confidence to string simple sentences together (and work on inflection and pronunciation if you have difficulties with that). And the best part to me is that it is an entirely audio course, so it’s something I can do in the car without having to put in time with a textbook, so the time I wasn’t using for anything useful anyway can get put to studying. And I suppose if you can get it for cheap and you’re a beginner, or if you’re intermediate who has never worked much on speaking practice, it might be worth it. That said there’s a lot of criticism of the course I tend to agree with, also. Like this review mentioned, it feels a lot like a course that is specifically geared toward a married businessman, and if you’re not one, it’s sometimes pretty weird or awkward in the choice of dialog scenarios you have to go through, and you’re probably not going to directly use most of the phrases you learn. To me, that doesn’t mean it’s not useful– personally I have a lot of trouble just coming up with sentences on my own, especially when I have very minimal vocabulary, which is why I really enjoy having Pimsleur do the “creative” side for me in the early stages. In the downsides specific to Japanese, all the usage patterns are either polite or teinei, which, while it’s nice to know, I know is making me sound a little extra formal and weird. I’m actually not sure if there’s any good resources for specifically learning what forms of speech to use in which situations, because Japanese is so complex about it; I think I really need to start doing sentences in Anki that I pull from things I watch. I suspect context and practice is pretty much going to be the best way to figure it out, though I also plan on picking my tutor’s brain more. Anyway, I just started using Pimsleur’s beginning Mandarin course as well, which has been an interesting experience. I attempted to use the beginning Russian course a while ago, but found that since I didn’t have any intuition about the pronunciation/word-break rules in Russian, it was much too difficult to follow along. I keep being a little concerned/annoyed that most of the language materials I find teach a Beijing accent? I’m not sure where I’d find much material to teach a Taiwan accent, though, so I figure it’ll just have to be something that once I reach a point of moderate conversation, I’ll just have to have my mom and aunties (oh god, I’m definitely not ready for those conversations yet) tell me if I sound too weirdly Beijing. The key point to grasp from the last post is that I’m a horrible wuss who’s afraid to post on Lang-8 because even though I need the correction, being bombarded by a half-dozen people redlining my writing is way too intimidating. Whoops. I might just print it out and take it in to my tutoring session to have my tutor go over it first, ahah. Haven’t had JOI lessons for two weeks, because I just haven’t had the time, really, but now that I have all the points in Anki, I plan to study them this week so that I can fill out my homework (finally) on the weekend, and be all caught up to hopefully input each set every week from now on. I’m definitely not liking the way I set up the grammar cards entirely, but for now it’s sort of workable, and I don’t want to redo all of the notes, so I’ll just try a different setup with the next set and see how it goes. 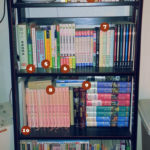 My Japanese bookshelf… mostly. I kind of just wanted to see if it all would even fit on one shelf, and the answer is: no. There’s more HanaKimi on another shelf, as well as random one-off books I probably forgot about. Also underneath are books for Taiwanese and Mandarin, ahah. ハガレンかるた. A set of karuta cards, FMA-themed. I don’t know how to play karuta, and even if I did, I have no one to play with, so they’re just in the box? The tiny yellow book next took the karuta set is a random deconstruction of Earthsea that someday I will be able to read. They were giving them out for free in front of Kinokuniya one year I was in Japan, and I love Earthsea, so I picked one up even though I can’t read it. Mostly the rest is 十二国記 (Twelve Kingdoms) and the three on the end are Rose of Versailles, none of which I’m able to read yet. But someday. Vols 1, 12-16, & 18 of FMA (I’m in the process of completing the set… don’t ask me why I bought them out of order in the first place), Clover. Bilingual readers. The one on the far left is very old, it was my parents’. The Japanese is rather antiquated, but it’s kind of a neat book. The other two I picked up at the regular bookstore. They’re still a bit beyond my level, so I keep starting and stopping them. Japanese readers. The first three are all for 一年生. The others are some of the White Rabbit set. More manga. Utena, vol 1 of HanaKimi (rest is elsewhere), vol 1 of XXXHolic (which is all I have), Wish, Tokyo Babylon. I haven’t read any of these in Japanese yet. And more manga. 2, 3, & 5 of D.N.Angel on top of Card Captor Sakura. Novels. Something I don’t even know on top of the Japanese translation of Songmaster, 雨ふる本屋, and Harry Potter. Things I will read at some point, when I can? Old textbooks for Japanese and Classical Japanese (aka Tale of the Bamboo Cutter and 古い日本語 dictionaries). JLPT prep books. Some old? Like the red one is the old N3, so more or less the current N4. The two horizontal ones up top are the two I’m actually working on with my tutors. Several are for N2 and N1 which I haven’t even looked at yet. Miscellaneous things. Colloquial Kansai, Japanese Slang, Jazz Up Your Japanese with Onomatopoeia, Words in Context, A Dictionary of Japanese Idioms, Making Sense of Japanese, Essential Japanese, and then several books my mother bought me that I have no idea what they even are, because I don’t even read the other things I own, lulz. Two books I’ve had since I was a kid: Kaguya-hime (I loved this picture book and her fancy kimono), and The Giving Tree in Japanese (or おおきな木 as it actually is titled). 2013] Finally refreshed the duct tape on the window of my car.